Published May 22, 2015 by Pearson IT Certification. Part of the LiveLessons series. These easy-to-follow video tutorials thoroughly prepare you for Microsoft’s new MCSA 70-346 exam and help you securely and efficiently manage Office 365 identities and cloud services in any environment. 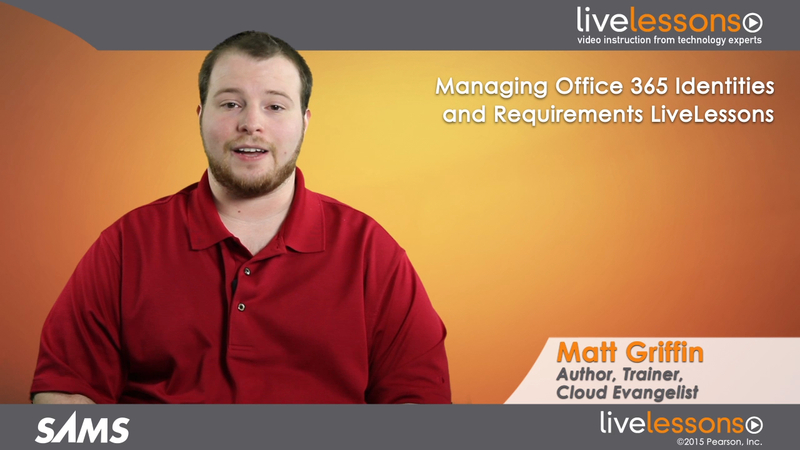 Using hands-on demonstrations, top Office expert Matt Griffin guides you through every MCSA 70-346 exam topic, showing how to administer Office 365 and related services for maximum efficiency and productivity. Managing Office 365 Identities and Requirements LiveLessons walks you through piloting Office 365 and provisioning Office services; ensuring strong security and efficient networking; managing cloud user identities with Azure Active Directory and DirSync; implementing and administering federated Single Sign-On (SSO); tracking availability and usage; streamlining and automating day-to-day user management; and troubleshooting the most common problems. There’s even a full lesson on Microsoft’s certification process—including some great last-minute study tips. In just over four hours, you’ll be ready for your exam—and any Office 365 administration challenge you’re likely to encounter.